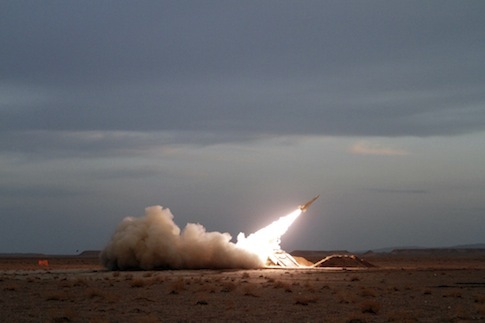 Iran test-fired an anti-aircraft missile system during a mock fight against Western forces early Wednesday as it continues to conduct a four-day military display during which it has unveiled several advanced weaponry systems, according to Iranian news reports. Iran’s Air Defense unit successfully fired a newly modified S-200 missile at a jet engine drone during a simulation of a possible attack on American or Israeli fighter planes, according to Iran’s Fars News Agency. The system reportedly is capable of targeting aircraft flying at mid and high altitudes. "The S-200 missile is a surface-to-air long-rang missile which is able to counter strategic aircrafts and semi-ballistic missiles," Brigadier General Farzad Esmaeili was quoted telling reporters, according to the Mehr News Agency. The drills began on Monday and are aimed at highlighting a handful of new domestically produced missile and defense systems capable of repelling an attack by Western nations. An estimated 8,000 Iranian military forces are said to be participating in the drills, which are noteworthy for both their scope and scale. Iran test-fired "medium-range and low-altitude missile systems" during Tuesday’s military display, according to separate reports. Iran’s Islamic Revolutionary Guards Corps (IRGC) and its Armed Forces jointly conducted an air drill Tuesday, according to Mehr. Military leaders also revealed a new domestically manufactured artillery system that is capable of hitting targets "with pinpoint accuracy" that "cannot be detected by the enemy’s tracking systems," according to the report. The unveiling of these advanced weapons and missiles is believed to be a warning to America and Israel against conducting a military strike on Iran’s nuclear sites. "Too often, the White House and Pentagon look at these Iranian exercises and conclude they have more time, especially when something the Iranians try goes wrong," said Michael Rubin, a former Pentagon adviser on Iran and Iraq. "This policy of procrastination is no substitute for strategy, however—after all, the Iranians can learn just as much from their mistakes as they can from their successes." The use of new missile systems indicates that Iran continues to have success building weaponry domestically despite Western economic sanctions. "At the very least, the exercises show the trajectory in which the Iranian military would like to go," Rubin said. "The exercises also should underline the notion that Iran’s indigenous arms industry is formidable and that sanctions alone will not be able to stop the regime." Iran also unveiled on Tuesday a missile system reportedly capable of striking air targets, Mehr reported. The new "Mersad" system "uses domestically manufactured Shahin missiles, which are even more advanced than the 1970s-era U.S.-manufactured Hawk missiles," the report states. These new weapons systems should be viewed with caution, Rubin said. "We can pooh-pooh Iran’s conventional weaponry but should the regime develop nukes, all the regional states will be facing these new conventional missiles and systems every hour of every day, as the Iranians conclude that no one would dare retaliate against a country that has its own nuclear deterrent." Iranian military leaders have used the drills as an occasion to threaten the U.S.
"The era of military threats of the United States is past," Major General Hassan Firouzabadi said on Tuesday, accordingto Mehr. The major drills also come on the heels of a military flare up between the U.S. and Iran. Iran fired on an unmanned American surveillance drone earlier this month, according to reports. This was the first such attack by the Iranian regime. Firouzabadi referred to the incident as a sign of Iran’s regional strength. "We observed that the forces of the Islamic Republic of Iran powerfully shot at the U.S. drone and gave a firm response to them," Mehr quoted him as saying. Iran has increased both its military bluster and capabilities in recent months. "There’s a lot of chatter out there about possible diplomatic breakthroughs with Iran," said Rubin. "And in the corridors of [the State Department], there’s hope that the Iranians will somewhere, somehow reach out for Obama’s outstretched hand." The country’s oil output is said to have risen in October after seven straight months of plummeting sales. Iran’s continued aggression should be viewed as a sign of things to come, Rubin said. "It’s hard to accuse the Iranians of deceit," he said. "After all, they signal their intentions every day. And these military exercises are that signal." This entry was posted in National Security and tagged Drones, Iran, Israel, Middle East, Military. Bookmark the permalink.